Award-winning Welsh poet and author Mike Jenkins will judge our 2019 competition. Mike Jenkins has been widely published and is much in demand for his lively performances and writing workshops. He has performed at the Hay Festival, the Aldeburgh Poetry Festival and has read and tutored at Ty Newydd, the National Writers’ Centre for Wales. Mike has won Wales Book of the Year in 1998 for his collection of short stories ‘Wanting to Belong’. He has also won an Eric Gregory Award from the Society of Authors, The Young Writers Prize from the Welsh Arts Council for ‘Empire of Smoke’ and the John Tripp Award for Spoken Poetry. Mike is at the forefront of contemporary Welsh writing and is a fellow of the Academi, the Welsh Society for Authors. 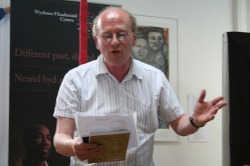 He is a former editor of Poetry Wales magazine and has co-edited Red Poets for 25 years, an annual magazine of left-wing poetry from Wales and beyond. He has previously judged our poetry contest, back in 2009. Poetry forms the bulk of Mike’s published work, though he has also written three novellas for young people and one for adults. His latest book is ‘From Aberfan t Grenfell’ (Culture Matters) with artist Alan Perry. Mike frequently appears on radio and television and is known among Cardiff City football fans as the club’s unofficial poet. Note: Unlike some competitions where the judge never gets to see your hard work our judges read every poem submitted. We do NOT use any filter judges. The poems will be judged anonymously to ensure a fair competition and unbiased result and winners will be announced on our website here as well as in the local and national press. My first attempt at welsh verse. Pam yr ydych wedi mynd? Some good judges here, although it would be nice to see some new ones too. Who will judge next year?